Have you ever found yourself dealing with the responsibility of maintaining a legacy application with poor code or unresolved defects? How do you determine if the program is leaking memory or if other vulnerabilities are present? Automated static analysis tools supply faster, more accurate results than manual code reviews. They provide accurate, objective information about vulnerabilities, software complexity, and help better understand developer or team productivity. Static analysis tools determine application size and identify vulnerabilities while generating key code metrics. The calculation is used in conjunction with additional assessment practices to determine complexity or identify defects. Static analysis tools that provide a benchmarking score are used by organizations and developers to monitor aspects such as code quality or productivity as software is created or enhanced. The benchmark measurement is effective for determining application size, complexity, and quality. As systems evolve, static analysis tools can be used to monitor code improvement efforts based on updated scores. It is a fast, cost effective approach to detailed source code evaluation. What Makes an Automated Solution Worthwhile? Static analysis tools offer organizations beneficial information for early defect identification, conformance to architectural standards, and improving software quality. Static evaluation methods are able to identify missed coding flaws, such as vulnerabilities residing between application layers. An automated static analysis tool helps programmers eliminate critical defects within source code. Missed source code defects account for a large percentage of problems experienced within an infrastructure including performance degradation, system failures, and compliance problems. Static analysis tools provide insight about potential vulnerabilities in complex environments where several languages or technologies exist. 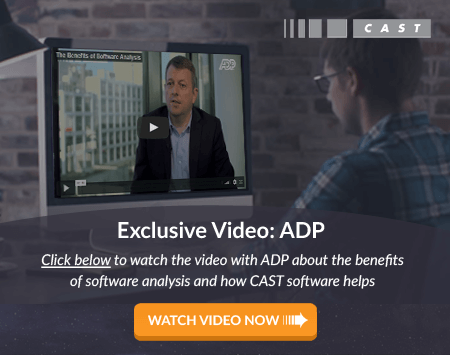 CAST AIP (Application Intelligence Platform) is the only enterprise-based solution capable of analyzing source code for multiple languages in multifaceted infrastructures. AIP creates extensive insight into the potential vulnerabilities accompanying software development or package upgrades across a large, multi-tiered infrastructure. Take a look at the insight automated static analysis tools can generate today!